I have seen the movie 2012 and I will admit the date of 2012 has a significance in everyone's mind and not just because of that movie. The Mayans and other civilizations have predicted that 2012 is the end date for our Earth. Many people argue that it is not the end, but just the beginning of a new age, or cycle. I have believed that this could also be true. However, I have done some research on the coming comet Elenin and have been observing its path on the NASA.gov website (I will include links below), now I am beginning to realize that 2012 could really be the end of Earth as we know it. Are you prepared for what I am about to share with you? Many people have been talking about comet Elenin on conspiracy websites like this one, and conspiracy forums. For a long time people thought that comet Elenin was going to come into contact with Earth, and be the end of civilization. If you go to NASA's website however, they try to debunk all of this information by showing you a diagram of Elenin's path that clearly looks like it misses Earth. Conspiracy theorists still think though that because Elenin is getting closer to Earth we are having more and more natural disasters, like earth quakes, volcanic eruptions, and tsunamis. On September 11th 2011 comet Elenin will be closer to Earth than it ever has been. This however is not the most serious comet you should be worried about. There are 2 more comets that take a more serious path of destruction, and if you think comet Elenin is the closest comet we have to worry about you are seriously mislead. The next comet I want to talk about is comet Honda. Comet Honda seems to be the closes to Earth on August 17th 2011. This is a much closer date than 2012. Who knows what kind of destruction this thing could cause. According to the NASA website the comet will pass on the underside of Earth's orbit, but it will pass directly underneath! Could this cause a pole shift? Remember no one knows the size of these comets, and they aren't being talked about in main stream news. Usually we don't even hear about the objects in space that come close to Earth, because scientists just aren't sure if they are going to make contact, and they don't want to cause panic. This is crazy, and I think everyone has the right to know. This is why I have done a lot of research on these space bodies. The definition of a comet is just an ice ball hurled most likely from the Oort cloud and usually gets pulled in by the star of a solar system, which in our case is our sun. This is why all of the comets seem to be moving in the direction of the sun. They are being pulled in by its gravitational pull. The longer the tail is on a comet the closer it is to the sun. What bothers me is that we have not seen any real pictures of these objects from NASA or any other space organization. This worries me, for 2 reasons. One reason is because these things could possibly not even be comets. The other reason is if these things are big enough, they could have a significant gravitational pull of their own, and throw Earth's alignment out of whack, and we could possibly have a pole shift. Not to mention if these “comets” DO make contact with Earth we could be looking at an extinction level event similar to what happened to the dinosaurs. The third and final comet that was found is comet Levy. If you ask me, comet Levy directly corresponds to the Mayan end date of 2012. Whats weird is how dead on the actual date of January 1st 2012 actually is. If you check out the NASA links below you will see that directly on the first day of 2012 comet Levy directly comes into contact with Earth! This is based on NASA's website. This has been on no news station and no one wants to talk about it. 2012 really could mean the end of all civilization. The only people that have a chance are people that will be living deep underground. Even then however if the whole Earth floods, or continents shift, underground bases won't do the global elite any good. I don't care how secure they think they are. Especially when they want to get out and can't because they are now under thousands of feet of water. Let me know what you think in the comments. You say I am wrong by .0564 AU? Give me a break. It doesn't matter what JPL says EXACTLY do you really think it is the whole truth? Do you really think they are accurate in predicting the future? I mean seriously, we still can't even predict if its going to rain or not correctly. Your argument is laughable. People are making a bigger deal about Elenin and I think Levy is at least worth attention, especially because based on JPL's graphs Levy does come closer to the Earth. Don't get on my case for sharing with people stuff I have found. Are you a spy blogger that works for the Government? 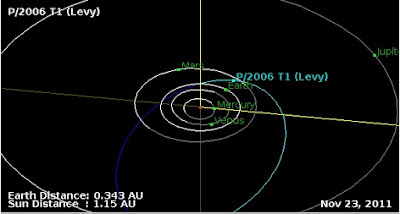 Just for people that are quick to say we are safe because of the exact path that JPL has put out on their website, here is a message they put on the top of their website: "The applet was implemented using 2-body methods, and hence should not be used for determining accurate long-term trajectories (over several years or decades) or planetary encounter circumstances." FYI, every time I click on your links I get kicked off the internet. (strange) Then I tried to copy and paste Url to directly into address bar. link did not work. What's wrong woth this picture? Celestial flower is the name given to a meteorite or a shootong star by the alchemist. At the same time objects owe part of their significance to their origin:objects fallen from heaven, such as aerolites and meterites for example, partake of the sacred character of Uranus andd consttitute a symbol of power of the celestial deities. Submarine objects, on the pther hand, posses a viscous and abysmal quality betoking their irrational nature and their aptness for the expression of all that is base and unconscious. Stones fallen from heaven served to explain the origin of life. And this stone which I have set for a pillar, shall be God's House Genesisseem to be invested with rather more modest powers. Evola points out that , for the alchemist,'between eternal birth, reintegration, and the discovery of the philosophers' stone, there is no difference whatsoever.Kaaba in Mecca Black Stone of Pessinus in appearence it recalls lava or basalt. Among the stones venerated by the ancients, we must not overlook the Greek omphaloi. Well it seems that your site was very wrong in fortelling the impact of comet levy with earth on jan 1 although I am a beliver in the 2012 end of life as we know it. It is important for all to understand that this earth is 4.5 billion years old and is not going anywhere any time soon but the human race will in fact leave this planet in the near future weather from our star or a comet impact or other natural impact we are doomed and that's that. Pray and find god he is the only way to live through these times ahead good luck to all and god bless!! It's obvious I was a little off, and comet levy didn't destroy the earth on 2012. In my defense the title of this article does have the keyword "COULD" in it but let's loom past that for now.... The fact is comet Levy did come closer than comet elenin, and there was a lot of hype revolving around comet elenin. People were blaming earthquakes and other natural disasters on the comet. If anything should be taken away from this article, it is this....atleast I was writing about a subject that mainstream media wouldn't even mention. Guess what comet Levy did come closer to the earth then elenin did. I hate when people nitpick at my facts, when the fact is i am doing research and being proactive and thinking for myself. That is more than most sheeple do on a daily basis. Go vote for another freemason.